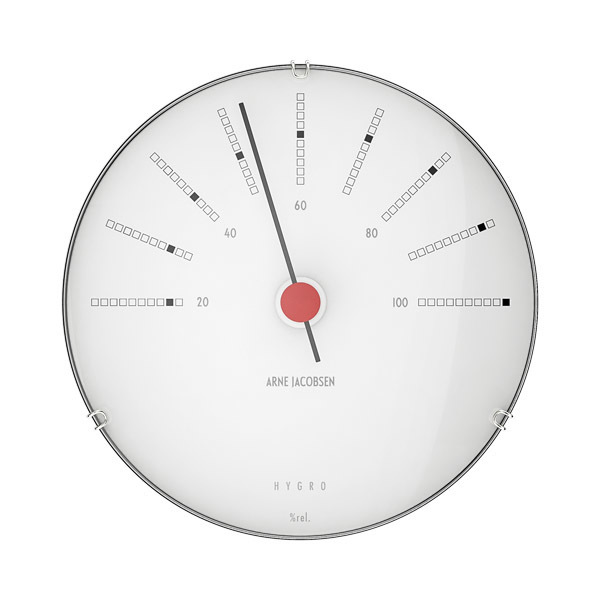 The minimalist AJ Bankers hygrometer features a monochrome dial with numerals, small coloured squares, black hands, convex glass front and a red detail in the middle. The special aluminium case gives the barometer a floating appearance when mounted on the wall. 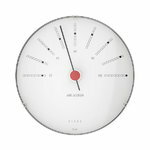 Build a beautiful weather station with the AJ Bankers wall clock, thermometer, hygrometer and barometer. Architect and designer Arne Jacobsen designed the Bankers Clock for the National Bank of Denmark in 1971. To ensure the Bankers collection’s authentic design, Rosendahl Design Group has worked in close collaboration with Teit Weylandt, the former head of the product development division at Arne Jacobsen’s studio.